Nestled between the holiday buzz and the summer crowds, #wvcellarseason is the perfect time to enjoy an intimate tasting experience. 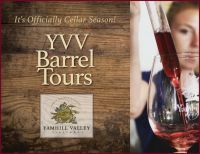 Take refuge from the rain and learn what our cellar season is all about with our YVV Barrel Tour. Learn about our history, the complexities of our estate, how our winemakers ferment and blend wines, and then head into the cellar to see, smell, and taste from barrels of our Pinot Noir Reserve. Compare the wine from the barrel to finished wines in our Tasting Room to taste how bottling and aging complete a wine. Tours start promptly at noon. Arrive 5-10 minutes early to check in and ensure you don't miss a beat! Reservations are required and tickets must be purchased in advance.